You can see Cold Noodle Salad (Liang Mian in Chinese) everywhere (both at home and restaurant) in hot days in China. 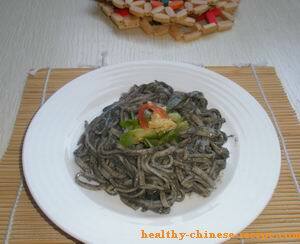 The simple and delicious one is noodle in sesame paste sauce mixed with cucumber strips. This is very popular in Northeast of China. In Shanghai people use peanut butter, bell pepper strips, potato strips, and JiaoBai strips. I used black sesame paste in this recipe. It's not so beautiful, but it's delicious and healthy. Black sesame nourishes Yin, benefiting our liver and kidney. You can replace with white sesame paste or peanut butter. Cucumber helps to clear away heat. This is very healthy Chinese food, suitable for people with obesity, heart disease, diabetics, etc. It's even better to use buckwheat noodle (Soba) if you are with diabetes. 1. Making sauce. Mix all the ingredients in a small bowl. Stir quickly till the sesame paste diluted and sticky. Add water and continue to stir if you feel the sauce is dry. 2. Cut cucumber into thin strips. Set aside. 3. Boil water in a pot. Slip in noodle. Stir and split by using chopsticks or a spatula. Continue boil till no white hard portion in the center (all becomes transparent), about 10 to 15 minutes. 4. Take out noodle by chopsticks or through a strainer. Pour the bottle water into a basin. Put cooked noodle in the basin. Soak to make the noodle cool. Take out and arrange in a big plate. 5. Pour the sauce on the noodle. Place cucumber strips on the top. Function: Clearing away heat, nourishing Yin.